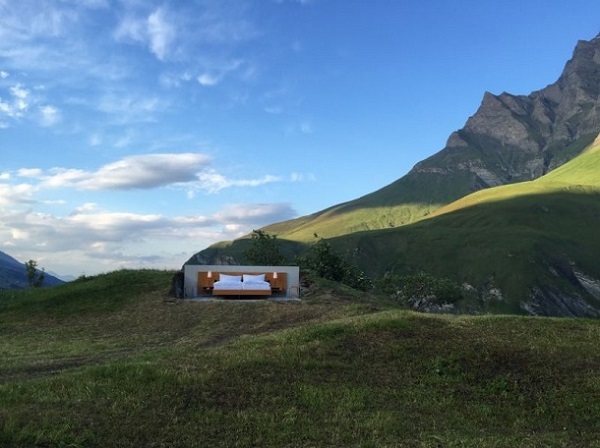 Holy moly, how would you fancy spending a night in a Swiss hotel that has no walls and it overlooks the Alps? Yup, it’s the ultimate room with a view! The concept was created by the genius duo of Frank and Patrik Riklin who wanted to introduce people to a whole new lodging experience. Well, as unusual as it might be, who would pass on spending a night in nature under the sky lit with millions of stars - all just for you to enjoy! Aw, a dream come true, if you ask me! What do you think? P.S: Also, this romantic tree camping in Gremany.